Surrey Mummy is loving….. The Little Gym Cobham! 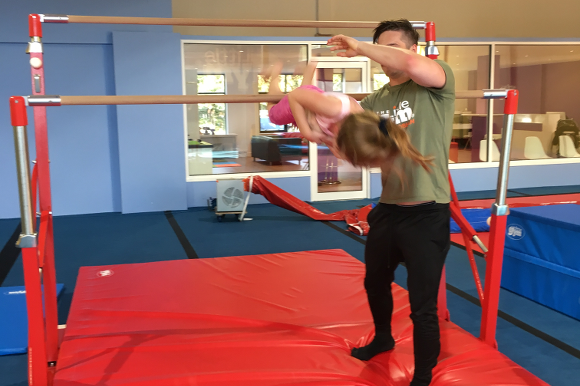 The new semester is now underway at The Little Gym Cobham and it promises to offer all sorts of fun for kids, from babies to 12 year olds. We experience both the Baby Birds (10 – 18 months) and Flips/Hot Shots (6-12 yrs) sessions and the children love it. The baby has acquired a much better range of movement, more coordination and a real “have-a-go” attitude since attending his first class. The beginnings of forward and backward rolls, balancing on the beam, handstands and bar work are all introduced in a fun way which challenges the babies without them realising! The instructors explain the purpose of the moves and are very informative about the link between the activities in the class and the baby’s development. Having enjoyed some summer camps during the summer holidays, my seven year old is raring to go in her classes which help her develop a range of skills in a non-competitive environment. The bars are her favourite and she spins around them with such strength, confidence and agility these days, it is hard to get a good pic! During the lessons, there is a spacious area for parents to relax with a tea or coffee and a magazine, and play equipment and books to entertain any siblings forced to watch through the glass. Parties are offered too and they look fantastic, adapting to a number of themes. Do check out what The Little Gym Cobham can offer for your family. You can book a FREE trial class to see what is on offer for you and your family. There are also some fun Halloween themed half-term camps - register soon as we think they'll be popular.